Winter in England has taken a turn for the grey and grumpy. It’s cold and wet and planning to be that way for a while. This makes for the kind of days when I have lights on all day long, and with the rain lashing the windows all I want to do is curl up somewhere with a book to read or a laptop to write my own. More often than not, weather like this drives me into the kitchen for a splash of warmth and some cheer. I usually start by hunting through the cupboards to see what’s around and the result of my labours is by no means certain. When I found dried cranberries and half a bottle of mulled wine, though… what happened next was predictable. A large handful of cranberries went into a generous glass of mulled wine to steep. I found a cinnamon stick to use as a flavoursome stirrer. The oven was set at 180°C and then I was off and running. Four apples – cored, peeled and chopped into chunks – ended up in an ovenproof dish with a teaspoon of ground cinnamon. The mulled wine and soaked cranberries joined the apples in the dish. The crumble mix went over the top like the most delicious of crunchy blankets. And finally the lot disappeared into the oven. I have a thing about writing while I cook. Or maybe cooking while I write. 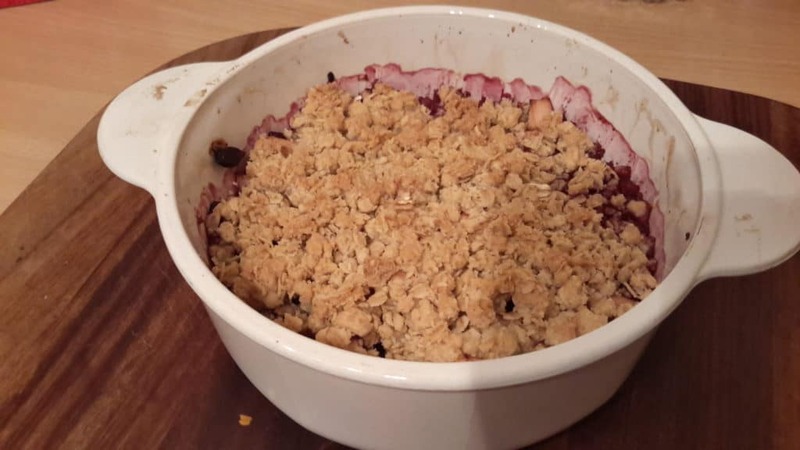 Crumble is perfect for that, just as stews, bakes or a large tray of roasting veg. Pickling and baking are not bad either. Once the prep is done I can sit down with a glass of something cheerful and write until my nose and the buzzer tell me there’s food to be had. That Saturday was no different. I was curled up on the sofa imagining an invisible staircase rising from the beach and curving out over the sea. And if the band of warriors marching off to do battle in the floating city looked a little like the cast from the 1980s BBC version of Robin of Sherwood… well, I blame the wine. That sounds wonderful. I’m currently curled up with one of our teenage cats enjoying the MLK holiday.